Northwestern Mexico and the southwestern United States including parts of Arizona, California, Nevada, Utah, and New Mexico. 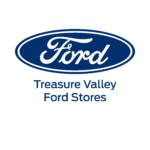 Arid and semi-arid habitats; prefers moister parts of the desert such as irrigated land and washes or rocky areas with scattered bushes. Active at night and dusk. Diurnal in the cold spring months. Length: Adult is 20 to 22 inches. Weight: 1 to 2 lbs. Up to 20 years in captivity. Rodents, hares, eggs of birds and reptiles, lizards, frogs, and large invertebrates. Body is squat and heavy with a relatively large head. The dorsal scales are rounded, beadlike, overlying bony tubercles (osteoderms). The ventral scales are quadrangular and flat. Color is black with orange, red, or tan scattered patterns with 4 or 5 bands on the tail depending on the subspecies. Offspring: 3 to 13 eggs. Incubation: Approximately 124 to 140 days. 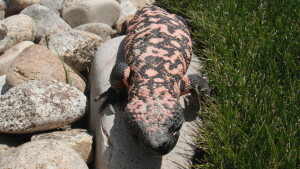 Gila Monsters are solitary except during the mating season in spring. They spend the majority of their time in burrows or under rocks during the day. Gila Monsters are capable of eating large meals at one time and can store fat in their tails for energy reserves. Their skin provides camouflage among the desert sand and pebbles. Gila Monsters are the only venomous lizard in North America and one of two venomous lizard species – the other being the Mexican Beaded Lizard. Venom, produced by modified salivary glands, does not enter the victim through hollow fangs as with venomous snakes. Instead, it enters into the mouth along grooves in the teeth and is injected by chewing. The venom is neurotoxic, affecting the respiratory and circulatory systems. Venom seems to be used chiefly in defense rather than in killing prey. The wild population is decreasing because of habitat loss due to agricultural and housing development and by past collection for the pet trade. 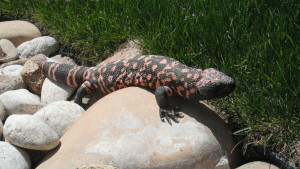 Gila Monsters are protected throughout their range and cannot be collected from the wild. Because they spend the majority of their time in burrows, it is difficult to determine a wild population estimate. 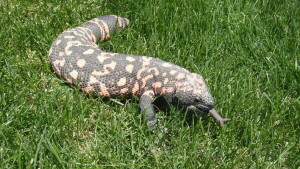 Gila Monsters do not move quickly; they eat prey that is easy to catch. They do not need to eat every day. It is the largest lizard in the United States. They come out only to eat.